For most citizens, buying a residential property (dwelling) is the most important transaction during their lifetime. Residential properties represent the most significant component of households’ expenses and, at the same time, their most valuable assets. The Residential Property Prices Indices (RPPIs) are index numbers measuring the rate at which the prices of residential properties are changing over time. RPPIs are key statistics not only for citizens and households across the world, but also for economic and monetary policy makers. 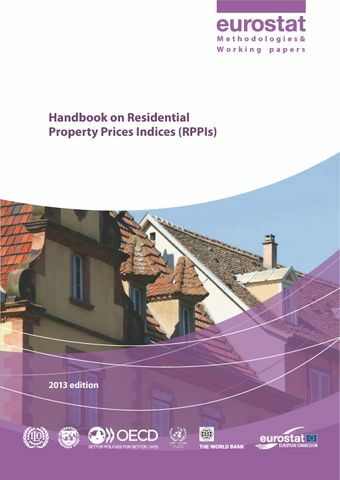 Among their professional uses, they serve, for example, to monitor macroeconomic imbalances and risk exposure of the financial sector.This Handbook provides, for the first time, comprehensive guidelines for the compilation of Residential Property Price Indexes and explains in depth the methods and best practices used to calculate an RPPI. It also examines the underlying economic and statistical concepts and defines the principles guiding the methodological and practical choices for the compilation of the indices. The Handbook primarily addresses official statisticians in charge of producing residential property price indices; at the same time, it addresses the overall requirement on RPPIs by providing a harmonised methodological and practical framework to all parties interested in the compilation of such indices.The RPPIs Handbook has been written by leading academics in index number theory and by recognised experts in RPPIs compilation. Its development has been co-ordinated by Eurostat, the statistical office of the European Union, with the collaboration of the International Labour Organization (ILO), International Monetary Fund (IMF), Organisation for Economic Co-operation and Development (OECD), United Nations Economic Commission for Europe (UNECE) and the World Bank.